The Ian Potter Children's WILD PLAY Garden at Centennial Parklands officially opened on the 18th of October! We have been waiting for this amazing space ever since we moved to Sydney and we are so happy to say that this beautiful little oasis is a special place for children and their families. From the moment you walk in the garden, you are automatically drawn by the cheer beauty, hard work and attention to detail landscapers and gardeners have put in to make this nature playground a beautiful place and an escape from the city. 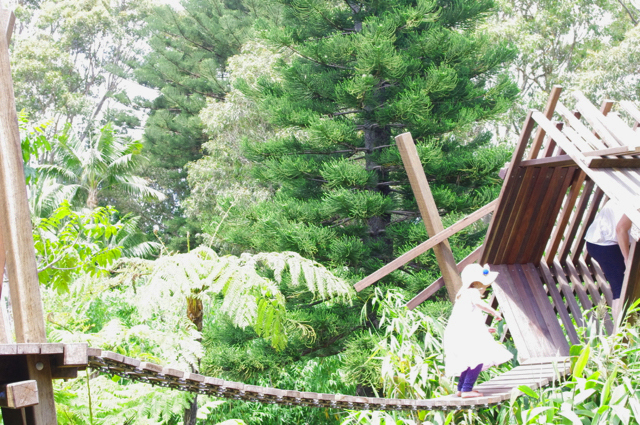 The Ian Potter Children’s WILD PLAY Garden is a 4 million dollar state-of-the-art nature play space designed to engage the five senses, and help children reconnect with nature. Complete with water, natural vegetation and soaring heights, children have the chance to get lost in nature and our little ones did just that! The Banksia tunnels are visually stunning and great for little climbers. WILD PLAY also features dry creek beds, an artesian water play area, a bamboo forest, turtle mounds and the park’s first treehouse. It’s a dramatic landscape in which children are encouraged to run, jump, play, learn and discover the wild side of life! Most areas are safe however children need to be supervised at all times as places like the wooden bridge, steps in the water areas, areas on top of the mounds can be a bit tricky or slippery for little ones. Parents joined their little ones in the adventure when we visited, to make sure they were safe and they could still enjoy the playground. Little Miss is 5 and a bit of a scaredy cat so I couldn't convince her to walk along the bridge and the treehouse and go down the long slide. However her brother and her were happy to walk and discover the garden at their own pace. We love the way this playground feels like it's always been there. It is such a serene spot to wonder, get lost and enjoy! We loved the little bamboo forest, it is such a cute little maze. The back area of the garden includes areas where children can walk along wooden stumps, where families can enjoy a picnic, enjoy exploring nature, walk under the beautiful trees, have a birthday party at the Discovery Centre and more! They can also enjoy building cubbies out of branches and relax under the shade or enjoy a sneaky ice cream as we did with the conveniently located ice cream truck! This area of the playground is large and great for groups to meet up, for families to switch off, embrace nature and relax. There are a number of mounds where kids can walk up to and discover the beautiful flowers and the overall view of this beautiful garden. We loved the little mound with a tunnel in the middle which leads kids to a sandpit, great for little nature explorers. The one thing which my little ones loved the most was the water play areas - to say they loved it was an understatement! I haven't seen them having this much fun in ages. We left this activity last so that we could dry up, get dressed, have a snack and head home. We parked our pram on the decking area for easy access to spare clothes, towels etc. The area is really nicely designed with little jets throughout the main water area and a large rock with a jet inside at the top of the water area which can be accessed via stairs. 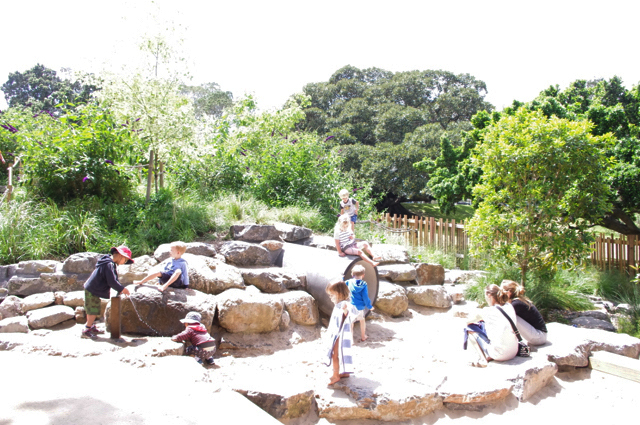 WILD PLAY is a beautiful little oasis among Centennial Parklands, perfect for little nature explorers and their families and perfect for the warm months coming up. We highly recommend this gorgeous place! Pack some essentials before you head out, park along Grand drive and enjoy every moment! The playground is located on Grand Drive pass the Homestead Restaurant and Centennial Parklands Visitor Centre, pass the Pavilion and located on the right side of Grand Drive. There is free 3 hour parking all along Grand Drive and its' open every day 10am to 5pm. Head during the week if you can to avoid the weekend crowds as this garden is very popular. 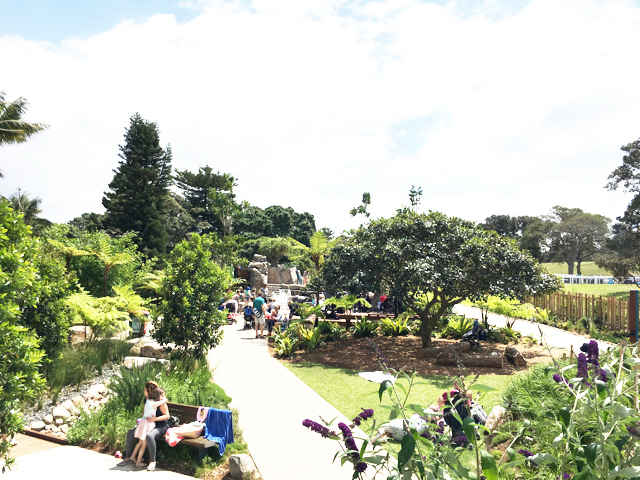 For more information about the Ian Potter Wild Play Garden at Centennial Parklands, head to their website.